It’s an hour until showtime so I better type quickly. I’m really looking forwards to tonight’s episode. I love theme songs. Yes, I am that level of Geek and I embrace it. We’re back to having all the groups together tonight. I feel badly for the short schedule because it feels very rushed. I also (in agreement with many others) find myself greatly missing the swan song. It’s just a really strong way to send off a group after they have competed. 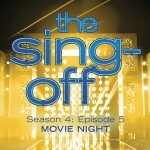 The Ultimate Sing Off still annoys me. It’s bothersome because it creates false looking rivalries in one of the few reality shows that tries to be “Feel Good.” Following any of the groups that compete you learn that there is camaraderie, respect, and outright love between the groups. I wish they’d show more of that. I specifically remember a moment in Season 3 where they showed members of some of the groups spontaneously doing a bass and rhythm to one of the visiting professional artists. It was a really strong moment showing the real fun of A Cappella. The group intro will be “(I’ve Had the) Time of My Life.” From the film ‘Dirty Dancing.’ This is a great ‘poppy’ hit that has fantastic room for different style male, female, and choral vocals. This should be a nice blast to start the show. Home Free – “Oh, Pretty Woman” – Roy Orbison. I sense in this one a potential for Home Free to fall back into the rut of “All Austin” with a quick show of the Bass to be impressive. Home Free has been good about being tight and keeping the fun up and is not for a lack of surprise. So as long as this isn’t “More of the Same” this should be a group solidly in the Top 4. Vocal Rush – “Against All Odds” – This is smart. Vocal Rush has an incredible sound when they have the intensity up but their Achilles heel comes from when they ‘blast off’ into fun. We haven’t seen them do a full straight ballad. We’ve seen songs with slow and fast. If they can keep this one under control; this could be a top seed for them. Acoustikats – “Old Time Rock and Roll” – Counter to Vocal Rush… This is dumb. Yes… Big movie hit. However, I’ve chatted about the fact that Acoustikats (the Gemini Group) wears the two faces of Frat Boys and Serious A Cappella Colllege group. Their problem is that when they go for the fun, they lose their edge and originality. This song is about as “Party” as you can get. The main vocals aren’t even sung. So, putting an actual vocal to it will distract from the original or not doing so will distract from being a competitive group. This seems like a lose-lose for the Kats. Filharmonic – “I Don’t Want to Miss a Thing” – In case you don’t remember this is, ‘That Aerosmith Armageddon Song.’ The Filharmonic is coming out with a Ballad. And one that I think would lend well to the Boy Band sound they have. This is the coin flip. This could either work stunningly well or be an exploding failure that would be called Glorious by a cadre of Kingons. (Did I mention that my Geek runs deep and I do embrace it. VoicePlay – “Don’t You (Forget About Me)” – I really like VoicePlay. I’ve made it clear. They have a Pentatonix vibe but different. Several people have actually gotten on the other side of the fence for this group because of this. This is a song that I think they will knock out of the park. It falls in their (to use a growingly annoying term) wheelhouse. But I think the pleasant surprise here is that we’ll see more of the other vocalists step up in this one and Honey may move to harmonies. This is a song like “Video Killed the Radio” that has such pure fandom and love behind it, that doing it right could seal them into the top two. Not doing it right could end the competition for them. I lean towards success. Ten – “Skyfall” – This is basically a Torch song from Adele. I think Ten is going to suffer the most from the short season. With the longer run of Season 3, the groups definitely had time to grow and mature. The shorter season doesn’t allow for much growth of experimentation. I think this is something strong for Ten’s voices. But the cohesion that we want to see may not get a chance to shine with this one. I have no idea how the Ultimate Sing Off plays into this tonight. Whether they just critique everyone and then put them all in the grinder (which personally I’d hate) or if it’s just for fun. I did see in the coming attraction someone singing (what I think was) “Fame” from the movie of the same name. For those under 25, the original with Irene Cara. I find this ironic because it was playing in the restaurant I had dinner at tonight. So, twice in one night would be a… um… treat? Potentially, this is the unannounced song for the Ultimate Sing-Off. See you all back in the next post and on twitter. How did my guesses match with yours?